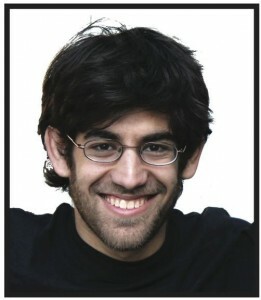 Dear Friends, Please join us as we gather to remember Aaron Swartz on the evening of Thursday, January 24th. I am so sad and angry. Our justice system has become so perverse. Never knew the man personally, only his work. A great mind lost too soon, persecuted by outdated policies and notions. Hopefully this will be the tipping point. Realy will be a great thankful story. You will be greatly missed! This we must Defend! I was wondering if a tribute was going to be held… I am very pleased to say the least… I’ll be flying home on the 22nd, so i’ll be making my way from Torrance all the way up to SF to make sure I attend this… Wouldn’t miss it for the world! Thank you for holding this; I’ll be there in my heart. His life’s work is not in vain and I am honored to join in with all of you to change the world. I am still speechless. Impressed by the impact of Aaron’s words, his actions and now the impact of his death. He changes us all. that you can change the world forever and that we want to help too. I wish I could have been at the Archive tonight, to remember Aaron. We use RSS each second of the day, it is a key part of the Internet. Bulk downloading is not a crime. Pingback: Aaron’s Army — Carl Malamud | It's My Blog, Dammit! …. Anything and Everything!